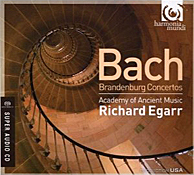 Richard Egarr, Academy of Ancient Music. Harmonia Mundi HMU 897461.62. Fair enough. But are the results worthwhile with so many other notable Brandenburg sets on the market? I mean, just the fine ones from Pinnock (Avie and Archiv), Marriner (Philips), Lamon (Tafelmusik or Sony), Leppard (Philips), Savall (Astree), Hogwood (L’Oiseau-Lyre), Apollo’s Fire (Avie), and Leonhardt (Sony) could fill a shelf. Well, obviously, that answer one can only determine for oneself, but I can say I enjoyed this new set from Egarr, although not enough to give it a recommendation. You’ll also remember that Bach’s Brandenburg Concertos sound different from one another because the composer never meant them to be a cohesive group. Margrave Christian Ludwig of Brandenburg commissioned Bach to write several pieces for him, and what he got a few years later from Bach was a collection of six works for various-sized ensembles and various solo instruments that the composer had probably written at various times for various other occasions. More’s the better for us. Concerto No. 1 is among the longest of the Brandenburgs and arranged for the biggest ensemble. It is also my least favorite, no matter who is performing it. Concerto No. 2 is among the most popular of the pieces and highlights the oboe, recorder, violin, and trumpet, the latter getting in some good playing time. Listeners probably know Concerto No. 3 as well as they know No. 2, maybe even more so. Concerto No. 4 is Bach’s most playful, with the soloists darting in and out of the structure. Concerto No. 5 is another of my personal favorites, highlighting solos from the violin, flute, and, unusually, harpsichord. One of the smallest ensembles, eight players, ensures a greater clarity of sound. While Concerto No. 6 is for me the least distinctive work of the set and uses the smallest ensemble, seven players, it never actually feels small. In fact, its only real deficiency is its similarity to Concerto No. 3, if usually taken at a slower speed. The first thing that strikes me about these performances from Richard Egarr and his AAM players is how gently they flow, how relaxed they sound. Egarr takes his time with them in an old-fashioned sort of way, rather than plowing through them in the quick-paced approach so favored by most other period-instrument bands these days. It comes as a pleasant surprise, even though it’s so different it may not be to everyone’s taste. The lower pitch is also a surprise and goes well with the stately tempos Egarr adopts. The “however” here is that the lower notes also tend to thicken the sound somewhat, making it less clear and focused. The effect may take some getting used to. And yet another surprise is Egarr’s decision to use a theorbo (a bass lute with two sets of strings attached to separate peg boxes, one above the other, on the neck) as part of the continuo in five of the six concertos. He calls the decision “a delicious luxury which I couldn’t forgo.” Frankly, I’m not sure he needed to do it; Bach didn’t call for it, probably for good reason, and it does rather sound a distracting note at times. It doesn’t help with the transparency of the sonics, either. None of which is to suggest that Egarr’s accounts of the Brandenburgs aren’t worthy of a listen. For example, the trumpet, recorder, oboe, and violin soloists in No. 2 are quite delightful. Moreover, No. 3 proceeds at a livelier gait than most of the others, and the players are immaculate in their articulation. No. 4 is among the most-charming realizations of this little concerto I’ve heard. The sound is still a little reverberant for my liking, but it takes nothing away from the music making. As I had hoped, Egarr brings off No. 5 pretty well, even if the second-movement Affetuoso (affectionate, with tender warmth) drags a bit. Interestingly, Egarr elects to use a guitar in here rather than the theorbo, and while it is hardly noticeable, it makes a nice contribution. Harmonia Mundi recorded the music in 2008 at St. Jude’s-on-the-Hill, Hampstead Garden, London, for playback via a hybrid stereo/multichannel SACD disc. The lower pitch makes the sound appear warmer than it probably really is, and the venue seems to inflate that warmth with its own natural hall resonance. The result, then, is a bit thick and veiled, even played back in the disc’s SACD mode, and not as transparent as one might expect from so small an ensemble. Oddly, too, despite the seemingly cavernous nature of the recording environment, there is relatively little space or depth to the sound. The harpsichord doesn’t come through very prominently, either, which may be good or bad depending on how you feel about harpsichords. Likewise, dynamics seem somewhat muted, possibly again because of the acoustic. Be this as it may, the sonics are pleasing enough, and they do tend to complement the gracious flow of Egarr’s interpretations, even when they won’t satisfy many audiophile listeners. Also, The Year 1941. 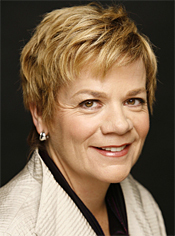 Marin Alsop, Sao Paulo Symphony Orchestra. Naxos 8.573029. After listening for years to Marin Alsop’s recordings with the Baltimore Symphony, it came as a pleasant experience to hear her also as the Principal Conductor of the Sao Paulo Symphony Orchestra (Orquestra Sinfônica do Estado de São Paulo, or OSESP). She took over the Brazilian orchestra on a five-year contract starting in 2012, and I believe this is her first recording with the group and the first recording in a complete cycle of Prokofiev symphonies she plans for Naxos. Sergei Prokofiev (1891-53) wrote the fifth of his seven symphonies in 1944, near the end of World War II. Next to his First Symphony, the Fifth Symphony is probably the most well liked of the bunch. The composer called the work “a symphony about the spirit of man,” his response to the turmoil of the War. As such it opens with the pain of that nightmare, a kind of prelude to the peace to come. By 1944 the Soviets could see an end to the War, and a relatively restrained opening Andante builds slowly, seriously and grandly, Ms. Alsop developing it with a gentle yet firm hand. A Scherzo follows, which lightens the climate considerably. You can tell the composer initially intended the music for his Romeo and Juliet ballet; you can feel the same spirit present. Ms. Alsop handles it particularly well, especially the surging, constantly shifting rhythms. Ms. Alsop’s high point, however, is the long, brooding third-movement Adagio, with its purely lyrical elements. Here, she brings out the delicate ballet-like qualities of the music. Although she takes most of the symphony at a fairly relaxed pace, she actually advances the argument of the Adagio at a greater intensity than we normally hear. It easily sustains one’s interest at a high level. The finale should bring the symphony to a joyful close, and Ms. Alsop accomplishes this end in good measure. Her interpretation is passionate, melodious, and triumphant, carrying the piece to a fitting conclusion that I found quite satisfying. 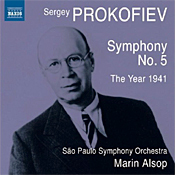 Coupled with the Fifth Symphony, Prokofiev’s symphonic suite The Year 1941 makes an apt companion. The composer wrote it in response to the German invasion of the Soviet Union, so what we get in the disc’s two works is music about the early part and the winding down of the War. However, Soviet censors didn’t much care for the tone of The Year 1941 (not finding it momentous enough); Soviet critics didn’t much like the music, either; and Soviet audiences didn’t much respond to it. There are moments within it, true, that seem to border on satire, but one cannot deny the work’s overall honest significance. I’ve always rather liked its various blustery war moods, and I particularly like the vigorous way Ms. Alsop responds to them. The Chicago Human Rhythm Project (CHRP) announced the establishment of the American Rhythm Center (ARC), a new initiative to provide a shared, affordable and sustainable education, rehearsal and administrative facility for several leading Chicago arts organizations. This new institution will be located in renovated spaces at Chicago’s historic Fine Arts Building, 410 S. Michigan Avenue, Chicago, IL. CHRP will develop ARC, a collaborative effort to foster community growth through rhythmic expression, in several phases. The aim is to offer diverse, high-quality dance and movement classes to the general public while centralizing the education programs, rehearsal space and administrative offices of several core groups, as well as additional emerging companies and independent artists. In the first phase of development, CHRP is updating space occupied for three decades by the Boitsov Ballet, which will feature three professional, flexible-use studios ranging from 750 to 1,500 square feet, as well as a remodeled lobby, dressing rooms and a separate floor of administrative offices. In the second and third phases, CHRP will add supplemental program space, a black box theater and updated administrative facilities. Limited operations will begin at the end of July in conjunction with CHRP’s 22nd annual Rhythm World Festival; a grand opening with all the partners will take place in early September. CHRP’s ARC has raised more than $1 million to date as part of a multi-phased $2.5 million capital start-up campaign. Jenner & Block LLP has provided pro bono legal support. Major funding for capital and start-up operations has been provided by Elaine Cohen and Arlen Rubin, The John D. and Catherine T. MacArthur Foundation, The Gaylord and Dorothy Donnelley Foundation, The Joyce Foundation and The Boeing Company, with additional support from Pamela Crutchfield, The Richard H. Driehaus Foundation, The MacArthur Fund for the Arts and Culture at Prince, Arts Work Fund for Organizational Development, the James. S. Kemper Foundation, the Illinois Arts Council, matching funds from the Polk Bros. Foundation through IFF and many generous individuals. Founded in 1990, Chicago Human Rhythm Project (CHRP) builds community by presenting American tap dance and contemporary percussive arts in world-class and innovative performance, education and community outreach programs. During the last 22 years, CHRP has produced multiple community-based collaborations involving shared revenue programs, concerts and touring opportunities, including: annual National Tap Dance Day concerts, featuring an array of tap and percussive dance artists; a shared revenue program designed to assist Chicago’s budding tap community to build capacity through audience development; Thanks 4 Giving, another innovative shared revenue program launched as part of its annual Global Rhythms concerts at the Harris Theater, through which CHRP has partnered with more than 100 Chicago-based nonprofits to raise funds for a wide variety of service agencies; and participation in the 5th Anniversary Beijing International Dance Festival, assembling 70 artists to represent the United States. The Merola Opera Program presented mezzo-soprano Susan Graham with the Merola Distinguished Alumni Award at a private reception on Saturday, July 14, 2012. The award, which has only been given out six times in the program’s 54 year history, is given to recognize extraordinary contributions to the world of opera by graduates of the Merola Opera Program. Susan Graham will join past winners Thomas Hampson, Patrick Summers, Ruth Ann Swenson, Carol Vaness, Deborah Voigt and Dolora Zajick as a recipient of Merola’s highest honor. 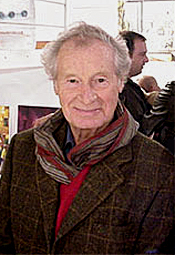 Celebrated as an expert in French music, Graham was named Chevalier de la Légion d'Honneur by the French government. Recently, she sang Mahler's Rückert-Lieder with Michael Tilson Thomas and the San Francisco Symphony and recorded the song cycle for the Symphony's own record label. Other recent performances include: Octavian in Der Rosenkavalier with the Metropolitan Opera; Dido in Purcell's Dido and Aeneas with Philharmonia Baroque Orchestra and Nicholas McGegan; Berlioz's Damnation de Faust with Lyric Opera of Chicago, which she also performed during the 2008-09 season at the Met and in The Met: Live in HD; the title role in Handel's Xerxes with San Francisco Opera; and Chausson's Poème de l'amour et de la mer with the New York Philharmonic under Sir Andrew Davis. At home and abroad, Susan Graham has sung leading roles from the 17th to 20th centuries in the great opera houses of the world, including Milan's La Scala, Royal Opera House, Vienna State Opera, Opéra national de Paris, Dresden's Semperoper and the Salzburg Festival. 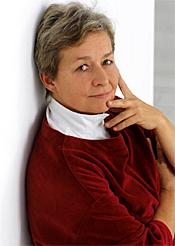 In addition, she has appeared with many of the world's leading conductors and orchestras. Free concert features crème de le crème of young Canadian musicians, U.S. premiere. Heralded as “Canada’s most important orchestra” (The Vancouver Sun), “outperforming the professional ensembles” (The National Post) and “the cradle of today’s professional musicians” (Le Choix), Strathmore will present the National Youth Orchestra of Canada’s (NYOC) unparalleled musicianship in the Music Center during a free concert on Thursday, August 9, 2012 at 7 p.m. The 95 members, ages 16 through 28 years old, will assert their musical agility with a technically-challenging program of Antonin Dvorák and Dmitri Shostakovich, with the U.S. premiere of Canadian composer Adam Sherkin’s Terra Incognita. For more information, call (301) 581-5100 or visit www.strathmore.org. 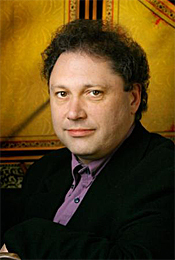 Conductor Maestro Alain Trudel has led orchestras in the UK, USA, Sweden, Russia and Japan, and has worked with many world famous artists, among them Ben Heppner, Anton Kuerti, Measha Brueggergosman, Pinchas Zukermann and Isabel Bayrakdarian. He returns to the NYOC this year reaffirming his dedication to this remarkable new generation of musicians. Dvorák cello soloist, Cameron Crozman, at 16 is a prime example of these rising stars. Studying cello since the age of 7, Cameron has won numerous awards and has performed widely, including a 2010 tour of China as part of the Talbot Duo, with a performance at the prestigious Shanghai Oriental Arts Centre. The NYOC was the founded by conductor Walter Susskind, Music Director of the Toronto Symphony Orchestra. After an astonishingly successful and well received summer pilot workshop for young musicians in 1960, the organization quickly became a federally chartered, non-profit organization devoted to the discovery and training of accomplished young Canadian musicians. As it has matured, the NYOC has become Canada’s preeminent training body dedicated to perfecting the skills and talents of young musicians for careers as professional orchestral players through intensive summer session programs and touring opportunities. More than 40 percent of professional orchestral musicians in Canada are NYOC alumni. The NYOC’s concert tours have included every major Canadian city as well as occasional trips to the United States, Europe and Asia. The Juno-nominated NYOC earned the title “Best Youth Orchestra in the World” at the World Youth Orchestra Conference and recently celebrated its 50th anniversary. Also, Borodin: Music from Prince Igor. 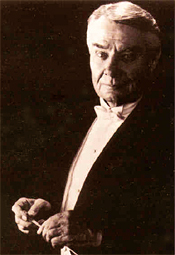 Robert Shaw, Atlanta Symphony Orchestra and Chorus. LIM UHD 057. This newly remastered audiophile edition of Stravinsky's Firebird Suite from LIM (Lasting Impression Music, an affiliate label of FIM, First Impression Music) takes me way back. I believe it was just the second album recorded by the then-fledging Telarc Records corporation. When it came out on LP in 1978, it made Telarc one of the first companies to release a digital recording of a major symphony orchestra. Their first digital album had been with Frederick Fennell and the Cleveland Symphonic Winds doing Handel and Holst, and this one with the Atlanta Symphony followed soon after. 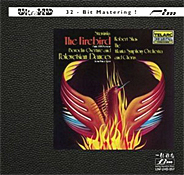 I remember all this because I was writing for the $ensible Sound magazine at the time, and Telarc was kind enough to send me a copy of The Firebird Suite for review; I got rather excited since the recording was among the first of its kind. I also remember, though, that while I found the sound quite good, I was not as taken by Shaw’s performance, which seemed OK but not exceptional to me at the time. So it was with much anticipation that I looked forward to hearing it again after more than three decades, remastered to today’s best audio standards by LIM. And what would I find out? Maybe the newly invigorated sound would help me to appreciate Shaw’s rendition even more than I had before. Anyway, the Russian-born, American composer Igor Stravinsky (1882-1971) wrote his complete Firebird ballet in 1910, and along with his subsequent ballets Petrushka (1911) and The Rite of Spring (1913) would forever influence the nature of symphonic music, closing out the Romantic era and ushering in what today we refer to as the Modern period of classical music. I doubt that Stravinsky had any idea of the ultimate impact he and others of his generation were introducing into the world of music, but we’re all probably the better for it. Certainly, the Firebird shows us the beginnings of these changes, although not nearly so much as the Rite of Spring would just a few years later. The Firebird could hardly lose. Stravinsky based the ballet on various Russian folk tales about a magical bird that could grant help or harm to those who captured him. A young prince wandering through the enchanted land of Kashchei the Immortal happens upon the bird and captures him. The bird grants the prince a magic feather in return for his release. From there we get an adventure involving the prince, a group of fair lovely maidens, an inevitable love, an argument between the prince and Kashchei, some physical conflict, and a final resolution courtesy of the bird. It’s all very exotic, warmhearted, and exciting. In 1919, the composer devised a suite from the complete ballet, paring it down to about twenty minutes or so. Much later, in 1945, he revised the suite, making another, longer one, but Robert Shaw chose to record the earlier, more familiar arrangement. This original suite benefits from being more concise, offering all of the most-familiar music in a briefer form. Under Shaw, the introduction has a suitably dark and mystical quality to it. “The Firebird and Her Dance” comes off well, too, with more color than I had remembered from my first listen so long ago. The “Round Dance of the Princess” sounds sweet and melancholy at the same time and conjures up comparisons to the work of Rimsky-Korsakov. “The Infernal Dance of Kashchei” displays a good deal of energy and generates a requisite passion. Then the anticlimactic “Lullaby” leads us effortlessly into the Finale, which Shaw infuses with much joy and jubilation, ending with a truly thunderous crash from Telarc’s patented big bass drum. If I could find any “however” involved, it is that at a much lower cost one can buy Antal Dorati’s complete Firebird on a Mercury Living Presence recording, which remains the benchmark performance of the work and still sounds remarkably good. Alternatively, one could also buy Riccardo Muti’s rendition of The Firebird Suite coupled with Mussorgsky's Pictures at an Exhibition on a single EMI disc, both of which are excellent recordings interpretively and sonically. Nevertheless, Shaw’s rendition does have the benefit of LIM/Telarc’s superb sound, the best of the lot, and, the fact is, the performance is better than I first gave it credit. Under Shaw’s direction, the two accompanying pieces by Aleksandr Borodin (1833-1887)--the Overture and “Polovetsian Dances” from Prince Igor--share a similar distinction with The Firebird. These performances may face stiff competition from Georg Solti and the LSO on LIM’s own audiophile remastering of Decca’s Romantic Russia, but they’re satisfactory in their own, more-romanticized, low-key manner, especially the choir, which sings splendidly. Telarc engineer Jack Renner and producer Robert Woods recorded the music in Symphony Hall, the Atlanta Memorial Arts Center, in June of 1978. The sonics as remastered by LIM in their 32-bit UltraHD mastering process are sharply focused without in any way sounding hard, metallic, edgy, glassy, or “digital.” Indeed, the recording has a full, rich, fluid texture that probably replicates the sound of the orchestra and hall pretty well, a sound from LIM slightly smoother than Telarc’s own mastering. The miking is a tad close for my taste, but it does capture a wonderful clarity and in the Borodin very natural, lifelike voices, if not so much orchestral depth. As expected, the bass is deep and transient impact impressive. Michi Gaigg, L’Orfeo Barockorchester. CPO 777 050-2 (2-disc set). What do you mean you’ve never heard of Josef Myslivecek? He was a contemporary (1737-1781) of Wolfgang Amadeus Mozart, a composer who came from Prague to Italy to Vienna to make his fortune, who wrote more symphonies and operas that practically anyone at the time, who engaged in business dealings with Mozart’s father, who people say had an influence on the younger Mozart, and who, like W.A. Mozart, died at a relatively young age, forty-three. If you’ve never heard of him, well, neither have many people today. 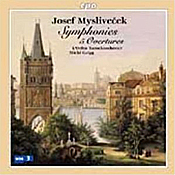 One listen to the first of seven symphonies on this two-disc set and you say to yourself, “Sounds a lot like Mozart or Haydn.” Then by the time you get to his third or fourth symphonies, you’re saying “Sounds a lot like Myslivecek’s first few symphonies.” The problem with the symphonies, which occupy the first disc, is that they show too little invention and seem all to sound alike. The second disc tends to rectify this situation considerably, however, as the five overtures contained there are far more interesting, more original, more lively, more sparkling, and more glowing than the symphonies. I quite enjoyed them but couldn’t understand why CPI hadn’t put them on the first disc to get our attention. Likewise, I couldn’t understand why CPO arranged the symphonies in such an odd fashion, starting with No. 3, going to Nos. 5 and 6, then back to No. 4, 2, and finally No. 1. I thought the booklet would explain something about the arrangement being the actual sequence of their composition, but it mentioned nothing of the matter. Maybe the record producers arranged them in some kind of order of popularity. I dunno. The most outstanding aspects of this album are the exuberant playing of L’Orfeo Baroque Orchestra under the direction of Michi Gaigg, and the equally vivacious sound produced by the CPO engineers. The two dozen or so players in the ensemble ring out clearly and distinctly, with never an overly bright or unduly dull moment. The stereo spread is wide, the tonal balance is near perfect, and the stage dimensions show more than adequate depth. Disc two, especially, is a joy to listen to, although, as I say, the symphonies on disc one are a bit of a chore. HJ Lim, pianist. EMI 50999 4 64952 2 8 (8-CD set). Beethoven so enjoyed piano sonatas, he wrote thirty-two of them between 1795 and 1822. While he probably didn’t intend them as a single cycle with any unifying subject matter, pianists ever since have been playing them in conjunction with other pieces in the series, sometimes presenting all thirty-two of them over a succession of nights. Then, with the coming of the sound-recording age, pianists clamored to prove their worth by releasing complete recorded sets. I confess I have heard in its entirety only one of the dozens of such sets currently available, that of Alfred Brendel (Philips), but I have other discs of select sonatas from the sets of Wilhelm Kempff (DG), Arthur Rubinstein (RCA), Sviatoslav Richter (EMI), Emil Giles (DG), Stephen Kovacevich (EMI), Vladimir Ashkenazy (Decca), Claudio Arrau (Philips), John O’Conor (Telarc), Maurizio Pollini (DG), Murray Perahia (Sony), and Vladimir Horowitz (RCA). And, of course, there are what seem like hundreds of other single and multi-disc collections of the sonatas available, so choice is almost endless. 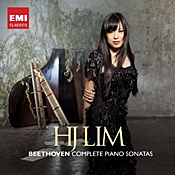 In 2009 Korean pianist HJ Lim burst onto the musical scene with a popular YouTube video of a Rachmaninov and Chopin recital she had done, followed by an appearance in Paris where she performed the complete Beethoven sonatas. These events so inspired the folks at EMI Classics, they signed her to record the sonatas in the set we have here. There is little question about EMI’s excitement: Ms. Lim’s playing is wonderfully virtuosic, her performances remarkably intelligent, if highly idiosyncratic, and her personal appearance strikingly photogenic. It’s a winning combination for any performer. Let's begin our look at the set by noting how Ms. Lim has chosen to present it. First, she has laid out the sonatas over eight discs, four two-disc packages. Second, she has opted to record only thirty of the thirty-two sonatas, omitting Nos. 19 and 20, which Beethoven wrote for family, friends, and students and whose publication he suppressed. Fair enough. Third, she has organized the sonatas not chronologically but according to a personal thematic arrangement. Thus, you will find various of the most-popular works sprinkled in amongst less-familiar pieces. This has the advantage for the listener of spicing up the content with variety. The first disc in the set tells us a great deal about the direction Ms. Lim will be taking in the whole cycle in terms of approach, survey, and sound. She starts by including three sonatas-- No. 29 “Hammerklavier,” No. 11, and No. 26 “Les Adieux”--under the thematic heading “Heroic Ideals.” In her extensive booklet notes, the pianist explains her intensions by saying something to the effect that Beethoven had a special relationship with his Creator, a relationship he tried to communicate in his music. She continues by referring to the myth of Prometheus, the demigod giver of arts and fire to mortals; to Beethoven’s temporary admiration for Napoleon; and to the composer’s increasing deafness. While her critical analysis of the composer’s life and her own individual reflections appear weighty, much of it also seems rather dry and academic, ultimately providing less insight into Beethoven’s motivations than they might seem. Likewise, Ms. Lim spends three lengthy paragraphs on the composer’s metronome markings, saying on the one hand that he was pretty definite about things but finally concluding that the markings probably don’t matter as much as the pianist’s having “the right feeling.” If it all begins to seem rather highfalutin and vague at the same time, it probably is. I’d advise just listening to the music and ignoring much of the categorizing and composer examination. Ms. Lim begins with the “Hammerklavier,” that most brawny, lengthy, and difficult of all the sonatas. You’ve got to give her credit for starting right in with the heavy lifting and getting the show going with a rousing opening act. She attacks the Hammerklavier” with vigor and passion, demonstrating both a scholarly and dazzling command of the piano that will serve her well throughout the cycle. If I have any minor reservation about the performance, it is the same as I have about all of her work: namely, that she appears to have a youthful enthusiasm that leads her into very fast finger work in the outer movements and sometimes less than penetrating interpretations of the slower sections. She is blazing, to be sure, but a quick, simple comparison to someone like Alfred Brendel indicates she still isn’t as mature or understanding as she may be in a few more years. Although No. 26 is a little more traditional and Ms. Lim’s speeds a bit more conventional, she still doesn’t let much or any sentimentality show through in her reading, which can be both radiantly fulfilling and frustratingly severe. The first disc also tells us everything we will need to know about the sound. EMI recorded Ms. Lim playing a Yamaha CRS piano in Faller Hall, La Chaux-de-Fonds, Switzerland, in 2011. The result is one of the cleanest, clearest piano recordings you’ll find, with excellent transparency and taut transient response. The venue is modestly resonant, and the piano shows up warmly and richly most of the time, with only a few instances of cold or hard sound. Since the clarity corresponds well to Ms. Lim’s analytical approach to the music, it’s undoubtedly a good fit, and I have no complaints. I found it extremely easy to listen to. Disc two finds five sonatas categorized under the heading “Eternal Feminine -Youth.” Now, I don’t know about you, but I’ve never really thought about Beethoven in terms of “eternal feminine.” Still, I suppose Ms. Lim’s characterizations of Sonatas Nos. 4, 9, 10, 13, and 14 “Moonlight” do, in a way, fit that description. The music is of a sweeter, gentler nature than most of the other sonatas, Beethoven as the true romanticist, the passionate yet wounded lover. The “however” is that Ms. Lim plays them with almost the same dispassionate precision she applies to the “Heroic Ideals” group. As an example, she zips through the famous opening Adagio of the “Moonlight” lickety-split. For comparison, both Brendel and Kempf take a little over six minutes to complete the movement; Ms. Lim takes about four and a half minutes, a full twenty-five percent faster. It’s not that her playing doesn’t come highly charged with emotion; it’s that it doesn’t necessarily convey much in the way of tragic or romantic feeling. Disc three begins the next volume, and it contains Beethoven’s three earliest sonatas, Nos. 1, 2, and 3, under the heading “Assertion of an Inflexible Personality.” The “personality” is that of Beethoven, and Ms. Lim explains in the booklet that the young composer was typically confronting fate through a youthful rebelliousness. Perhaps it’s Ms. Lim’s own youthful rebelliousness that’s at issue here; I don’t know. In any case, listeners may recognize the opening Allegro of No. 1 from its use accompanying countless silent movies, and Ms. Lim seems to have a good time playing up its extensive melodrama. Nonetheless, I rather enjoyed its minor rebellion, too. Likewise, she provides a youthful exuberance in the other two sonatas. Something like the dramatic innocence of the first three sonatas, the fourth disc finds four sonatas in the category of “Nature”: No. 15 “Pastorale,” No. 21 “Waldstein,” No. 22, and No. 25. In these works, Beethoven follows a course characteristic of the newly flowering Romantic Age in describing the universal appeal and dramatic innocence of the natural world. Here, we find Ms. Lim in extraordinarily good form. Her “Pastorale” is especially welcome, a genuinely ardent, expressive, descriptive view of Earth’s wondrous landscapes. If I have any minor reservation, it’s that her playing is so dextrous and precise that it almost seems as though at times she’s showing off. Her rather fast, heady plunge through the “Waldstein,” for example, appears more intellectual than it does insightful, more engaged in technique than it is a revelation of the soul. Still, with piano playing so scintillating, it’s hard to argue with the results. Again, EMI’s recording is clear and strong, well sustaining the performance. And so it goes. Disc five contains three sonatas, Nos. 5, 6, and 7, under the umbrella “Extremes in Collision.” By this Ms. Lim means that these sonatas are polar opposites, and to prove the point she tends to play up the differences. I quite liked her interpretations of the slow movements; the Adagio of No. 5, for instance, is exquisite. And even if her intensity doesn’t do much for me in some of the outer movements, I appreciate her conviction. Disc six takes us to the theme of “Resignation and Action,” containing Sonatas Nos. 16, 17 “Tempest,” 18, and 28. The “however” continues to be that while she is undoubtedly an exciting pianist to listen to, she seems not to capture fully the introspective moments of, say, the Adagio of the “Tempest” with the same deep emotion of a Brendel, Kempff, or Perahia. Disc seven Ms. Lim calls “Eternal Feminine - Maturity,” reflecting back on the earlier “Eternal Feminine - Youth” theme, now from Beethoven’s older perspective and containing Sonatas Nos. 24, 27, 30, and 31. Then, the set closes with the category “Destiny” and includes two of the composer’s most-popular sonatas, No. 8 “Pathetique” and No. 23 “Appasionata,” along with Nos. 12 and 32. It’s as though she were saving the best for last, and certainly she does up the two named sonatas in fine, fervent style, with yet much hushed confidence in the slower segments. In the end, I’d say that for anyone interested in a one-and-only, possibly first-time purchase of a complete set of Beethoven piano sonatas, Brendel or any favorite pianist from those at the top of the review might be a safer bet than Ms. Lim’s EMI set. This is not to say, however, that one should not hear or sample or possibly own one of the single discs from Lim’s set; nor should one avoid Lim’s complete set as a second or third or alternative choice in one’s collection. There is no denying her playing is brilliant and blazing, her interpretations vital, and EMI’s sound clear and natural. It’s just that Ms. Lim’s performances may be too highly personal as one’s only realizations of these works. Having proven himself a beacon of light in preserving and renewing French music, conductor Ryan Brown has been honored with the Medaille d'or du rayonnement from La Renaissance Française. For more than a decade, Brown has delighted international audiences with his re-discovery and inspired performances of masterful French operas of the 17th and 18th centuries. Brown is the founder, artistic director, and conductor of the Washington, D.C., based Opera Lafayette which, in addition to sold out seasons at the Kennedy Center and in New York City, has been engaged in an ambitious recording agreement with Naxos since 2005. Recent releases in their quickly growing discography include Monsigny's Le Deserteur and Rebel and Françoeur’s Zélindor, roi des Sylphes. Continuing his mission of casting light on ignored French masterpieces, Brown recently led Opera Lafayette in their debut performance of Monsigny's compelling Le Roi et le fermier at the Opera Royal in Versailles. This autumn Opera Lafayette fans can expect Naxos to release Grétry's Le Magnifique, followed by Le Roi et le fermier in 2013. The non-profit French organization La Renaissance Français was founded in 1916. Brown was presented with his award by French Ambassador François Delattre on May 31st in Washington, D.C. Program presents Wolfgang Amadeus Mozart’s La finta giardiniera on Thursday, August 2 at 8 PM and Saturday, August 4 at 2 PM at the Cowell Theatre at Fort Mason Center, San Francisco, CA. The cast features bass-baritone Gordon Bintner, tenor Casey Candebat, soprano Jennifer Cherest, tenor Theo Lebow, mezzo-soprano Sarah Mesko, soprano Jacqueline Piccolino and soprano Rose Sawvel. The production will be directed by Nicholas Muni and Gary Thor Wedow will conduct. Conductor Gary Thor Wedow has been hailed for “hot music making” by the Baltimore Sun and “convincingly elegant period style” in Opera News. His most recent successes include Orphée and Die Zauberflöte for the Seattle Opera, Le donne curiose for Wolf Trap Opera and Agrippina for Boston Lyric Opera. 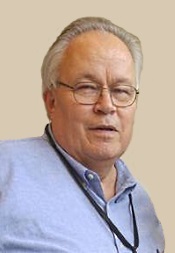 Mr. Wedow has been a member of the Juilliard School faculty since 1994. 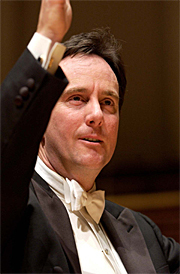 He has established an enviable reputation for dramatically exciting and historically informed performances with opera companies, festivals and choral organizations throughout North America. Director Nicholas Muni returns to Merola having most recently directed the popular 2009 production of L’amico Fritz. 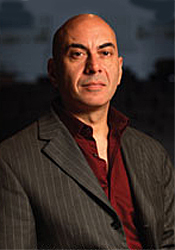 He currently serves as an Associate Professor of Opera and Distinguished Artist in Residence at Cincinnati Conservatory of Music. Mr. Muni has served as Artistic Director for Tulsa Opera and Cincinnati Opera as well as director of drama for the Metropolitan Opera Young Artist Development Program. As a freelance stage director, he has directed over 200 productions with companies in North America, Europe and Australia. Recent directing credits include the US premiere of Wagner’s Das Liebesverbot at Glimmerglass Opera, Carmen at Boston Lyric Opera and Postcard from Morocco and Of Mice and Men at Cincinnati Conservatory of Music. Set in Italy in the early 1900’s, Merola’s production of La finta giardiniera follows the story of the Marchioness Violante Onesti, who flees her home and disguises herself as a gardener after her lover, Belfiore, attacks her and leaves her for dead. In her quest to confront Belfiore, Violante, who now goes by the name “Sandrina” encounters a cast of colorful characters and finds herself caught between people who would do anything to get what they want. Dealing with heavy issues such as attempted murder and madness as well as lighthearted themes of love and mistaken identity, La finta giardiniera is both comedic and serious, combining elements of both to arrive at a happy ending. On Tuesday evening, the Board of Trustees of the California State University approved naming rights for the outdoor venue, to be called the MasterCard Performing Arts Pavilion. This is the first corporate partnership of its kind for the campus. Located on the picturesque Sonoma State University campus in the heart of California’s Sonoma wine region, Weill Hall officially opens Saturday, September 29 with an Opening Night concert featuring Chinese piano sensation Lang Lang. Beginning Wednesday, July 18, MasterCard cardholders will enjoy presale access to the twenty Priceless performances that comprise the 2012-13 MasterCard Performance Series (Sept. 29, 2012 through April 27, 2013). Tickets go on-sale to the general public on Sunday, July 29. A focal point for music in the region, the inaugural season in Weill Hall features an array of internationally acclaimed performers including vocalists Stephanie Blythe, Eli-na Garanc(a, Joyce DiDonato and Barbara Cook; celebrated classical soloists Yo-Yo Ma, Vadim Repin, Wynton Marsalis and Anne-Sophie Mutter; acclaimed early music ensembles Philharmonia Baroque Orchestra and Chorale, Tallis Scholars and Il Complesso Barocco; and Latin jazz greats Chucho Valdés and Buika. The Santa Rosa Symphony, Resident Orchestra, offers a full season of programming at the Green Music Center and the San Francisco Symphony will perform four concerts. 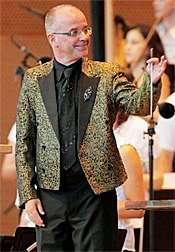 Andrew Mogrelia, Slovak Radio Symphony Orchestra. Naxos 8.572924. 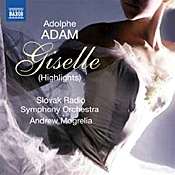 Giselle ou Les Wilis, which French composer Adophe Adam (1803-1856) premiered in 1841, has been around as a staple of Romantic ballet music for over a century and a half, and for good reason. The story of Giselle has all the ingredients for great listening: a supernatural, melodramatic plot involving dead spirits and curses and such; a young hero and heroine in love; a cruel if not downright evil villainess; and an appropriately rousing yet sentimental finale. It's hard for any conductor not to be able to bring out the beauty and excitement of the score, and Andrew Morgrelia does it as well as almost anyone in this set of highlights from his complete Naxos recording. People have made many cuts, additions, and changes to the ballet's working score over the years, so having only the highlights isn't as drastic a situation as you may imagine. In fact, the shorter score is probably best of all for home listening. At about an hour, it has not only the advantage of conciseness but of continuity, presenting the work's best and most well-known music in a seamless medley. Besides, the highlights fit nicely on a single disc. For those requiring the full score, I can recommend Mogrelia, of course, from which this set derives; plus Fistoulari's old recording with the LSO (Mercury) and Bonynge's with the Royal Opera House, Covent Garden (Decca), all in two-disc sets. They include almost every bit of music Adam wrote for the work and additional material he didn't write, along with every possible repeat. However, I would also add that if it's only the highlights you want and you're willing to pay a little more for the very best, the folks at HDTT have remastered Jean Martinon's 1958 recording with the Paris Conservatoire Orchestre, and it benefits from not only the best performance of the music ever but the best sound as well. Anyway, back to Mogrelia. His interpretation of the score is graceful and elegant in a smoothly Romantic manner. It's not quite as characterful as Martinon's version or the others, but at least it's close. Let's say Mogrelia's rendition is more genteel than Martinon's, Fistoulari's, or Bonynge's. Mogrelia and his Slovak players produce a performance that sounds very balletic as opposed to one intended solely for the concert stage. That is, Mogrelia appears to be leading an actual ballet production rather than making a stereo recording. Although there is not too much in his rendering to set the blood to racing, there is a great deal of beauty and lyrical refinement involved. The Slovak Radio Symphony play with a charming ease, even if they are not always as polished as some other big-time orchestras in this work. Naxos took the highlights for this 2012 disc from Mogrelia's complete set, recorded in the Concert Hall of Slovak Radio, Bratislava, in 1994. The sound is big, warm, round, and sometimes a little thick in a typically Naxos way, with a soft glow occasioned by the resonance of the hall. Moreover, while you also hear a kind of velvety texture to the sonics, which is pleasing and easy on the ear, there isn't a lot of orchestral depth or much dynamic punch involved, except in the first act March and a couple of other places where we find a few good bass thumps. Still, you get a wide soundstage and a feeling of sheer size, even if the midrange is a tad veiled. Also, Danse macabre; The Carnival of the Animals; Allegro appassionato. 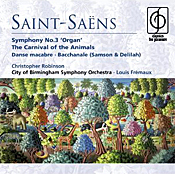 Louis Fremaux, City of Birmingham Symphony Orchestra. EMI Classics for Pleasure 0946 3 82233 2. This is just a note in case you're counting the number of times record companies have released Louis Fremaux's recording of Saint-Saens’s "Organ" Symphony over the years. EMI first released the recording in 1972 on their Columbia Studio 2 vinyl label, EMI's answer to Decca's Phase Four at the time. It was quite a spectacular LP in its day and recorded, as I remember, in four channels. But EMI never officially imported it to this country, and EMI's American Angel division never to my knowledge issued it over here. Instead, Klavier released it on LP in the U.S., Klavier being one of the country’s smaller record companies and specializing back then in taking up some of the slack left by the bigger outfits. Appealingly, the Klavier LP mastering was leaner sounding and in some ways more transparent than the original EMI. After that, in the late 70's, EMI issued a second LP of the work in their mid-priced Greensleeve series. This time the sound seemed even warmer and more bass dominant than before. Then came the CD era in the early Eighties, and again it was Klavier who first issued a full-priced CD of the recording in America. And again the Klavier sonics were slightly more natural sounding than the subsequent, mid-priced EMI Studio CD that followed it in the U.S. After that, Klavier withdrew the recording from their catalogue. Meanwhile, EMI issued it several more times, the recording appearing in a bargain-priced, two-CD Seraphim set, on a mid-priced Eminence disc, and on the current Classics for Pleasure issue. In between time, a company called Royal Classics issued it (1994) coupled with a Dvorak Ninth Symphony conducted by Rudolf Kempe. Interestingly, the EMI English sound has remained consistent over the years--warm, mellow, bassy, and robust--just as Klavier's sound filled in a little more of the middle. Why do I mention any of this at all? Because Fremaux's performance of the "Organ" Symphony is the only version I have ever felt was worthy of mentioning in the same breath as Charles Munch's famous 1959 RCA recording with the Boston Symphony (available on RCA or at extra cost on an XRCD audiophile remaster by JVC). The Fremaux performance deserves its multiple releases. The interpretation displays energy, zest, excitement, and grace aplenty, with a second-movement Adagio that flows over the listener in soft, warm waves. My only minor concern at the moment is that if one wants the absolute best sound in the Fremaux recording, one has to find a used copy of the old Klavier (LP or CD), and that may be difficult without paying an arm and a leg for it. 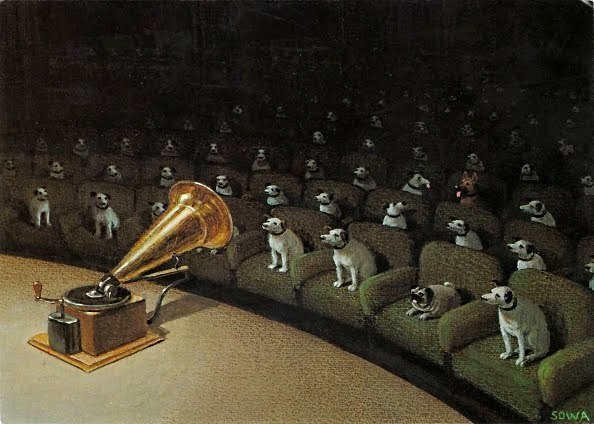 Maybe someday one of the audiophile houses--FIM or HDTT, perhaps--will remaster it, and we’ll have the best of all worlds. In the meantime, the Classics for Pleasure release contains not only the symphony, which is brief at well under half an hour, but good performances of the Danse macabre, The Carnival of the Animals, and the Allegro appassionato as well. It’s quite a bargain. Also, 12 Contredanses and the Finale from The Creatures of Prometheus. 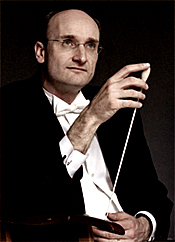 Andrew Manze, Helsingborg Symphony Orchestra. Harmonia Mundi HMU 807470. Beethoven wrote his Symphony No. 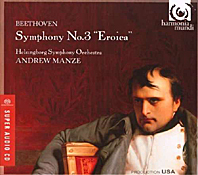 3 “Eroica,” Op. 55, in 1804 and premiered it in 1805, marking something of a new beginning in the development of symphonic structure and prompting endless discussions among critics about what it all means. Violinist and conductor Andrew Manze tells us what it means: It means riveting music, even if his interpretation is more elegant than it is scintillating. 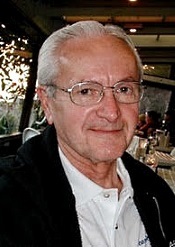 Manze, who specializes in repertoire from the late seventeenth to early nineteenth centuries, was the Music Director of the Academy of Ancient Music from 1996 to 2003 and then the Artistic Director of the English Concert, both period-instrument groups. Since 2006 he has been the Principal Conductor of Sweden’s Helsingborg Symphony Orchestra, who play on modern instruments. It makes no difference; Manze brings with him the adventurous sensibilities of a period-instrument conductor, making his performance of the Third Symphony something more than ordinary. Accordingly, Manze takes the first moments of the symphony’s opening Allegro con brio in strong, broad strokes, followed by a highly charged, exceptionally heroic follow-through. For the first few minutes, the conductor maintains a constant forward momentum as though Napoleon himself were driving straight through Europe hell-bent on world conquest. These initial statements characterize a Beethoven with plenty of snap, the intensity always under Manze’s utmost control. However, the conductor is not excessively stringent about his tempos, varying them considerably over the course of the movement, becoming quite gentle at times and then almost violent. The orchestra is relatively small at about fifty-nine players, and they offer up a lean, clean, intimate-sounding Third, even though with the speed changes Manze takes, the performance may not appeal to all tastes. With the Funeral March, Manze is more consistent with his pacing, not that that’s good or bad. He chooses to observe a steady, dignified tempo. While it is slower than Beethoven’s tempo markings would indicate, it’s close to what a lot of older, traditional conductors such as Bohm, Barbirolli, and Klemperer provide. More important, Manze keeps one’s attention for the duration, never allowing the music to sound like an actual dirge, even if it is one. It’s in the Scherzo that Manze shows off his period credentials, taking the composer at his word and producing a very quick, bubbly concoction that’s hard to resist. Nevertheless, it’s in the Finale where Manze and his players truly shine. Tying the closing statement nicely to the first movement, he opens broadly, then proceeds to a stately gait, followed by a gradual quickening. Manze adroitly controls the ebb and flow of the music while providing grace and excitement aplenty, especially in the big final moments. I enjoyed this interpretation immensely for its sensible, well-governed, yet bold enterprise, the interpretation seeming to get better as it goes along. Coupled with the Third we find Beethoven’s twelve little Contredanses and then the finale of the ballet from The Creatures of Prometheus. It’s not only good music, we see the relationships in the music. Listen to the seventh Contredanse, the ballet music, and then the Finale to the Third, and you’ll see what I mean. Together, it puts the icing on a very tasty cake. The sound Harmonia Mundi obtain is beautifully clear, detailed, and well balanced tonally, with just the right amount of resonance and air around the instruments. Recorded in SACD at Helsingborgs Konserthus, Helsingborg, Sweden, in 2007, the sonics are among the best I’ve heard in this work. I listened to the SACD stereo and regular stereo layers of this hybrid stereo/multichannel recording and found them both dynamic and wide ranging, the SACD sounding a touch more precise and forceful. If there is any small reservation I might have it’s that there is sometimes a bit too much activity from the left side of the stage, with not quite enough to fill in the middle. In fairness, I only noticed this effect on occasion, so it is probably not worth mentioning. Otherwise, we hear a strong, taut transient response, with a percussion and impact that never sounded better in a recording of the Third. And other American choral works. 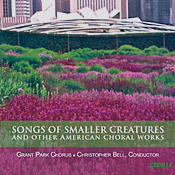 Christopher Bell, Grant Park Chorus. Cedille CDR 90000 131. The Grant Park Orchestra and Chorus, publicly supported organizations that offer free performances at the Grant Park Music Festival in Chicago, Illinois, each summer, have been entertaining listeners for years with frequently offbeat, little-known material. Here, the chorus goes it alone under the direction of Christopher Bell and present a collection of short pieces by modern American composers, some of the works descriptive, some serious, some humorous, some of them in world-première recordings, and all of them a pleasure. The program begins with the music of Abbie Betinis (b. 1980), her three-movement vocal work that gives its title to the album, Toward Sunshine, Toward Freedom: Song of Smaller Creatures. The composition begins with “The bees’ song,” a cute, expressive piece based on a poem by Walter de la Mare, a piece with lots of z’s in it. Next is “A noiseless, patient spider” from the Walt Whitman poem, followed by “envoi,” which uses a nonsense text by Charles Swinburne, the music sounding, as a note explains, like the hushed flapping of butterfly wings. It’s all very simple yet quietly haunting and moving. After Ms. Betinis we get Buzzings: Three Pieces about Bees from Lee Kesselman (b. 1951). More of those z’s! The three pieces are “To make a prairie,” “A Bee his burnished carriage,” and “Bee! I’m expecting you,” all deriving from poems by Emily Dickinson. Like most of Ms. Dickinson’s poetry, the songs are brief, sweet, and meaningful. The choir sing them, as they do throughout, with clarity, precision, and, most of all, with feeling. And so it goes, with music by Eric Whitacre (“When David Heard”), Stacy Garrop (Sonnets of Desire, Longing, and Whimsy), David Tredici (“Acrostic Song”), Ned Rorem (Seven Motets for the Church’s Year), and Paul Crabtree (Five Romantic Miniatures, which finds its inspiration in The Simpsons television show). The program ends with more from Whitacre, “Sleep.” As Whitacre notes, music often depends upon the “perfect balance between sound and silence,” and in this regard we may judge all of these presentations a success. The album will not disappoint lovers of choral music. Producer James Ginsburg and Cedille engineers Eric Arunas and Bill Maylone recorded the music in concert at the Harris Theater for Music and Dance in Millennium Park, Chicago, Illinois, in 2011. It’s a mildly reverberant acoustic, yet the sound is remarkably smooth and clean, with just a touch of natural hall resonance to give it a warm glow. The singers appear well spread out across the sound stage, and the engineers give them ample opportunity to communicate clearly and effectively. Because there is a sense of depth as well as breadth to the chorus, I would imagine it’s quite close to being there. Pianist Rudolf Buchbinder, whose interpretation of Beethoven has been described as “channeling the music from some cosmic beyond” (New York Times), will perform at Lincoln Center’s Mostly Mozart Festival for the first time in the festival’s history at 8pm on Tuesday, August 14 and 8pm on Wednesday, August 15, 2012 at Avery Fisher Hall, in Beethoven’s Piano Concerto No. 3 with Osmo Vänskä and the Mostly Mozart Festival Orchestra. In addition, New York audiences will have the unusual opportunity to hear Buchbinder in Beethoven’s Sonatas on the same evening – he will give pre-concert recitals at 7pm on both evenings on the stage of Avery Fisher Hall, featuring Beethoven’s Sonata No. 23 (“Appassionata”) on August 14 and Sonata No. 8 (“Pathétique”) on August 15. The concerts also include Mozart’s Symphony No. 32 and Schubert’s Symphony in C Major (“Great”). Coinciding with Buchbinder’s Mostly Mozart concerts, on August 7 Sony Classical will release his recording of Beethoven’s 32 Piano Sonatas in a 9-CD set entitled The Sonata Legacy. The Sonata Legacy is Buchbinder’s second recording of Beethoven’s complete sonatas, and is a live recording of his performance of the entire sonata cycle in seven concerts at the Dresden Semperoper between September 2010 and March 2011. Now 65, Buchbinder’s first recording of the complete sonatas was released thirty years ago in 1982 on the Teldec label, when he was 35. The Sonata Legacy was released in Europe in 2011 and sold out its first pressing, ranking on the Austrian Pop Charts and in the Top 10 on the German Classical Charts. Rudolf Buchbinder returns to the US on February 14-16, 2013 as soloist with the New York Philharmonic led by Alan Gilbert, and on March 8-10, 2013 as soloist with the Philadelphia Orchestra led by Christoph von Dohnányi. Buchbinder is enjoying a banner year in his lifelong passion for the music of Beethoven. In January, his live performance (as pianist and conductor) of all five of Beethoven’s Piano Concertos with the Vienna Philharmonic was released in the US as a 2-DVD set by C Major/Unitel Classica. The concerts were filmed live in May 2011 at the Goldener Saal der Gesellschaft der Musikfreunde in Vienna. In addition to the performances, the DVDs include a conversation between Buchbinder and music journalist Joachim Kaiser as bonus material. Rudolf Buchbinder’s concert calendar this year takes him around the world. His signature offering – the complete cycle of all of Beethoven’s Piano Sonatas (which he has performed in more than 40 cities worldwide since 1979) – began in Milan on January 25, in Hannover on March 25, and will begin in Beijing in October 2012 and in Berlin in December 2012. In March 2012, he was the soloist on a European concert tour with Andris Nelsons and the City of Birmingham Symphony Orchestra, with performances in cities including Coventry, Luxembourg, Vienna, Stuttgart and Frankfurt. 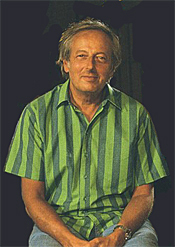 Further appearances on important international stages have included a concert with the London Philharmonic and Vladimir Jurowski (Moscow, April 1), performances with the Munich Philharmonic, with Buchbinder playing and conducting six Mozart Piano Concertos (May 25 to 28), as well as upcoming concerts with the Israel Philharmonic and Zubin Mehta (Tel Aviv on July 11 and 12; Haifa on July 15; Salzburg Festival on July 25). About Rudolf Buchbinder: Rudolf Buchbinder is firmly established as one of the most important pianists on the international scene, and he is a regular guest of such renowned orchestras as the Berlin Philharmonic, Vienna Philharmonic, New York Philharmonic, Orchestre National de France, London Philharmonic, National Symphony, and the Philadelphia Orchestra. He has collaborated with the world's most distinguished conductors including Abbado, Dohnányi, Dudamel, Frühbeck de Burgos, Giulini, Harnoncourt, Maazel, Masur, Mehta, Saraste, Sawallisch and Thielemann and is a regular guest at the Salzburger Festspiele and other major festivals around the world. Throughout the 2010-2011 season Rudolf Buchbinder had a particularly close cooperation with the Staatskapelle Dresden as its Artist in Residence in the first-ever position of “Capell-Virtuoso.” Rudolf Buchbinder is also the founding artistic director of the Grafenegg Music Festival, a major international music festival near Vienna which launched in August 2007. Of his appearance with the Los Angeles Philharmonic and Gustavo Dudamel, the Orange County Register raved, “You could hear the weight of his fingers, it seemed, falling onto the keyboard, each note given a nudged distinction. By avoiding both grandiloquent overstatement and dry objectivity, he plumbed the core of the noble simplicity in this music." 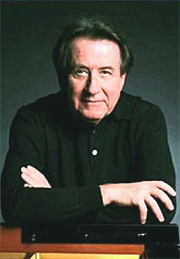 Rudolf Buchbinder has over 100 recordings to his credit, including the complete cycle of Beethoven sonatas, the complete Beethoven concertos, the complete Mozart piano concertos, all of Haydn's works for piano, both Brahms concertos, and all of the rarely performed Diabelli Variations collection written by 50 Austrian composers. The 18-disc set of Haydn's works earned him the Grand Prix du Disque. 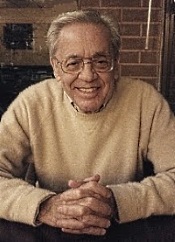 His cycle of all of Mozart's piano concertos with the Vienna Symphony Orchestra, recorded live at the Vienna Konzerthaus, was chosen by Joachim Kaiser as CD of the Year. Rudolf Buchbinder has also recorded live the Brahms piano concertos with the Royal Concertgebouw Orchestra under Nikolaus Harnoncourt, and all five Beethoven piano concertos with the Vienna Symphony Orchestra as soloist and conductor. In 2006, in celebration of his 60th birthday, he performed twelve Mozart piano concertos with the Vienna Philharmonic at the Vienna Festwochen, the live DVD recording of which was released by EuroArts. In November 2010 a live recording of the Brahms piano concertos with the Israel Philharmonic conducted by Zubin Mehta was released. For more information, visit www.buchbinder.net. The National Philharmonic to Provide Groundbreaking Music Education Program to William E. Doar Jr. Public Charter School for the Performing Arts in Washington, D.C. Starting in the fall, the National Philharmonic will partner with the William E. Doar Jr. Public Charter School for the Performing Arts (WEDJ PCS) in Washington, D.C., to provide an exclusive, groundbreaking music education program for WEDJ PCS students in kindergarten through 8th grade. The National Philharmonic will be in charge of all music education at WEDJ PCS. Groundbreaking in its scope and approach to music training, the program will provide intensive, daily music instruction from highly skilled National Philharmonic musicians and music teachers. Included in the program will be daily Suzuki-based violin instruction for all kindergarten through second-grade students. Children in grades three through five will get daily music instruction in a new piano lab as well as vocal training and lessons on orchestral instruments of their choice. Students in grades six through eight who select music as their concentration will spend nearly two hours a day benefiting from a customized program for individual music projects. In addition to music education, the school will offer instruction in dance, theater and the visual arts from such partners as the Shakespeare Theatre and the Kirov Academy of Ballet. All of these services will be provided at no cost to WEDJ PCS families. “We are thrilled that WEDJ PCS School has chosen the National Philharmonic to design and execute a music education program for their students. The school’s mission of providing music education to all is in keeping with the Philharmonic’s own mission in that the arts be completely accessible to everyone,” says Piotr Gajewski, National Philharmonic’s Music Director and Conductor. "We are excited to partner with the National Philharmonic to bring world-class music instruction from accomplished musicians and teachers into our school,” says WEDJ PCS Acting Executive Director John Goldman. “This collaboration means that our students, from diverse backgrounds, attending a public charter school, will have unprecedented and unparalleled access to musical excellence at no cost to their families. Our partnership with the National Philharmonic represents an amazing opportunity for our students." WEDJ PCS blends rigorous academics with world-class arts instruction provided by accomplished artists from renowned dance, musical, theatrical and visual arts institutions. WEDJ PCS is the only public school in Washington, D.C. to provide professional-caliber arts training for students in preschool through eighth grade at no cost to families. The school serves approximately 500 students. For more information about the school, visit www.wedjschool.us. In addition to presenting more than 30 annual performances at the Music Center at Strathmore under the direction of Music Director and Conductor Piotr Gajewski, the National Philharmonic offers exceptional and unique education programs. Each year, in partnership with Strathmore and Montgomery County Public Schools (MCPS), the Philharmonic performs for all MCPS 2nd and 5th grade students in concerts specifically designed for their age groups. The concerts take place at Strathmore over six days, making it possible for nearly 20,000 children to experience the thrill of hearing a live orchestra each year. In addition, annual winners of the Philharmonic’s high school concerto competition are given the exciting opportunity to perform as guest soloists with the Philharmonic at the fall concerts for MCPS second-grade students. Throughout the year, the Philharmonic offers master classes in which talented young musicians perform for and are mentored by acclaimed guest artists who appear in concert with the orchestra. All National Philharmonic concerts at the Music Center at Strathmore are preceded by free, pre-concert lectures. Each summer, the National Philharmonic’s String Institutes offer talented and aspiring middle school and high school musicians an intensive week of mentoring, chamber music coaching, individual lessons and ensemble rehearsals led by Maestro Gajewski, Associate Conductor Victoria Gau, members of the Philharmonic and other distinguished faculty. Another summer program invites talented high school singers for intensive vocal training, master classes and rehearsals led by National Philharmonic Chorale Artistic Director Stan Engebretson, Associate Conductor Victoria Gau and Montgomery College Choral Director Molly Donnelly. Also, the Philharmonic encourages young families to attend concerts by offering reasonably priced tickets and free admission to all young people age 7-17 under the All Kids, All Free, All the Time program, assuring its place as an accessible and enriching component in Montgomery County and the greater Washington, DC area. For more information, visit www.nationalphilharmonic.org . 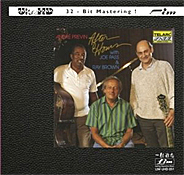 Andre Previn, piano; Joe Pass, guitar; Ray Brown, bass. LIM UHD 051. Good classic jazz is classical anytime, and when you have Andre Previn involved, it makes the connection all the more pronounced. Because Previn got his start in Hollywood and later went on to the world of classical music for the past fifty years--composing his own art music, chamber music, concertos, and operas and leading the Houston Symphony, the London Symphony, the Pittsburgh Symphony, the Royal Philharmonic, and the Los Angeles Philharmonic--it's easy to forget that he is also a superb jazz pianist. In fact, he has over forty jazz albums to his credit, nothing compared to his hundreds of classical recordings but nothing to sneeze at, either. Anyway, here on this remastered LIM-Telarc album, old friends Joe Pass on guitar and Ray Brown on bass joined Previn in 1989 for the first jazz album Previn had made in over twenty years. Previn says he wasn't sure if he still had it anymore, but the music proves otherwise. He definitely still had it. I suspect it's in his blood. Previn, Pass, and Brown sound as if they had been playing together forever. I suppose that comes of simply being good. The eleven pieces they play on the album are all very laid-back, easygoing in a winning, cozy manner. Previn, always a first-rate pianist--jazz or classical--is sometimes downright dazzling in his finger work. The music always sounds half improvised and half thoroughly planned out, which is probably the way all good jazz should come across. There is invariably that element of spontaneity about the notes, as though the performers were making it up as they went along; yet it all sounds so incredibly polished, you know it can't be so. After starting with some familiar material like Harry Warren's "There'll Never be Another You" and "I Only Have Eyes for You," we get to a terrific rendering of Philip Braham's "Limehouse Blues." It's a version that the trio can only call their own. Joe Pass on guitar has first billing here, with Previn's piano taking wing about halfway through and Ray Brown's bass always providing a solid foundation. Next, the fellows give Jerome Kern's "All the Things You Are" a particularly sweet, engaging treatment. Then Kern is back with "Smoke Gets in Your Eyes," which is maybe the one tune in the set the guys do most conventionally. It's also the standout number in the set. After a few more tracks, the penultimate number is a cozy rendition of David Raskin's "Laura," written for Otto Preminger's 1944 suspense movie of the same name. While it bears little relation to the song as played in the film, it holds charms of its own, not the least of which is the guitar accompaniment. They end with "One for Bunz," a fairly traditional improv where the men were just fooling around, warming up for the next number, and the tape caught it all. They decided to leave it in. Telarc originally recorded the music in 1989 at the Ambassador Auditorium, Pasadena, California. Although miked fairly close up, the sound has a warm, reverberant quality to it, which combined with the big size of the sonic image results in a very wide stereo spread for only three artists. There is a slight resonant veiling involved, yet the strong dynamic punch and reassuringly taut bass thumps more than compensate. Still, as I say, there isn't quite as much transparency or air around the instruments as you might hear on a few other jazz albums, such as the one LIM remastered a few years earlier, Jazz at the Pawnshop. Even though the sound is a tad thick, LIM's superdeluxe UltraHD 32-bit mastering process produces an experience close to what one might hear live, sitting a few feet from the performers. The piano feels right, too, and sonically the "Honeysuckle Rose" track is probably the best test of this lifelike effect.